If you’ve ever wanted to play or perform your favorite songs, or thought of a melody that could become an original song, KORG is here to help you realize your musical potential. 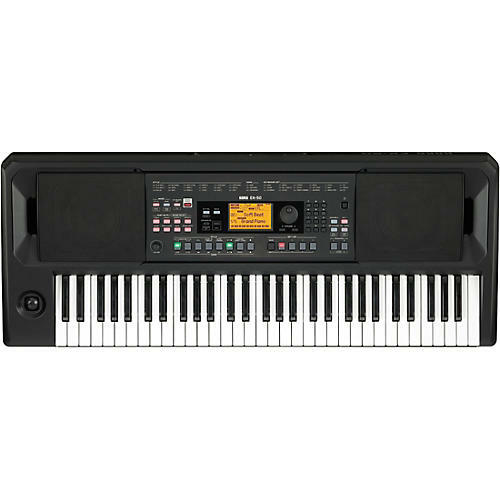 The KORG EK-50 is an entertainer keyboard that you can enjoy on any musical level, and an instrument that grows along with you. Automatic accompaniment “Styles” provide an entire backing band you as you play the keyboard. From the moment you start playing, the rich accompaniments are created to inspire you to add phrases as they come to mind. As you gain performance skill, you can easily access the more advanced functions to give shape to the ideas of your musical sketch. The EK-50 contains 64 “Music Styles” that preset the Style, sound and tempo suitablefor the songs that you’re familiar with. Simply selecting a Music Style and playing is an easy way to improvise or create ideas for original songs. Got a great new song idea? You can record your performances on the EK-50 and save them as well. Song mode lets you play back your own original creations, internal demo songs, MP3 or WAV audio data and SMF (Standard MIDI File) data saved on any commercially-available USB flash drive. You’ll also be able to play sounds while these songs play back.The EK-50 is open-ended, which allows you to add up to 96 styles via a USB flash drive. The EK-50 is equipped with automatic accompaniment functionality called “Styles,”which allow you to automatically produce a rich accompaniment with just one finger on the left hand, or by playing chords. Since this accompaniment changes according to the keyboard position or the chord that you play, you can easily improvise by playing the melody with your right hand. It’s like leading a band that knows hundreds of songs with the touch of a finger. EK-50’s onboard Styles cover more than 280 musical genres from around the world, each with four variations ranging from simple to complex, as well as an intro and ending for the beginning and end of the song. You can add variety to your performance by switching these buttons in time with the rhythm. There’s also an “STS” (Single Touch Select) function that automatically selects recommended when you switch Styles. It’s a perfect pairing of sound and Style, all set up and ready to go, so that you can focus on learning, creating or performing. The EK-50 contains more than 702 realistic sounds including pianos, violin, sax, and drums. You select and play the sound you need, whether you’re playing a solo performance or are playing in a band. You can also use the Split function to divide the keyboard and play different sounds simultaneously - such as piano with the right hand and bass with the left. This creates additional enjoyment with different combinations of sound. -Proof of Warranty - The customer must provide proof of purchase in order to obtain warranty service. The dated sales slip or copy thereof is the only acceptable proof of purchase. -The product must be purchased from a Korg USA authorized dealer and have a valid serial number. -Misuse, including damage occurring during shipment, damage caused by battery leakage, accident, fire, unauthorized repairs, tampering, cosmetic damage or other types of damage which are the result of improper handling or abuse. -The cleaning of controls or contacts due to exposure to dirty, dusty, or otherwise contaminated environment. -Damage to units used for loan or rental. Register online and extend your warranty! Register your new Korg keyboard, keyboard rack module or digital piano online and receive a certificate that extends the product warranty for an extra year from the date of purchase.